Spring has finally arrived! I can’t tell you how happy I am about it. The season brings growth, color, warmth, and a whole bunch of wonderful produce. One of the first signs in my yard is a type of onion that shoots up in spots before the grass comes out of dormancy. Those onions are hard to completely eliminate. I try to do my rubbing out weeds process on them and yet they pop up each year. I figure at least I can get inspiration from them. So spring onion is one of the greens in my Spring Green Rice. Green is my favorite color. It is obvious in the color choices I made for this blog. The psychology behind emotions that colors evoke is fascinating. Green is calming, represents nature, and is a great color choice for food to eat. My spring green rice has four different greens; spring onion (also called green onion or scallion), jalapeño pepper, green bell pepper, and parsley. It’s a combo of freshness with a little kick. Tying them together is creamy butter that coats the rice too. 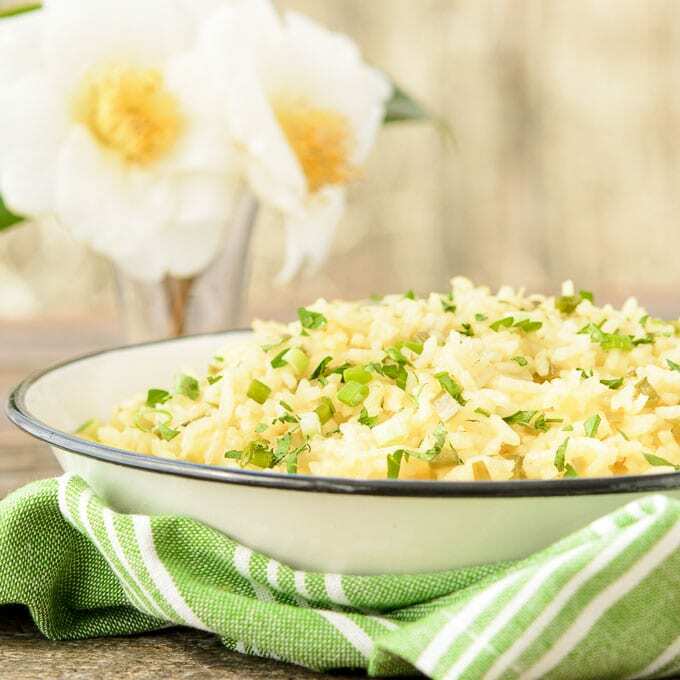 Spring green rice is a vegetarian dish. It gets a slight yellow hue from vegetable stock. The greens fade a little in color during the cooking process. A garnish of fresh green onion and parsley adds a pop of deep green color and extra flavor too. Are you looking forward to the produce of the season? I know a whole bunch of folks who do. They are Sunday Supper tastemakers and have some wonderful recipes to share. Scroll down to see the list and each one is a quick click away. Thanks to DB (aka Foodie Stuntman) of Crazy Foodie Stunts and Valerie of Lifestyle Food Artistry for hosting this Sunday Supper event. 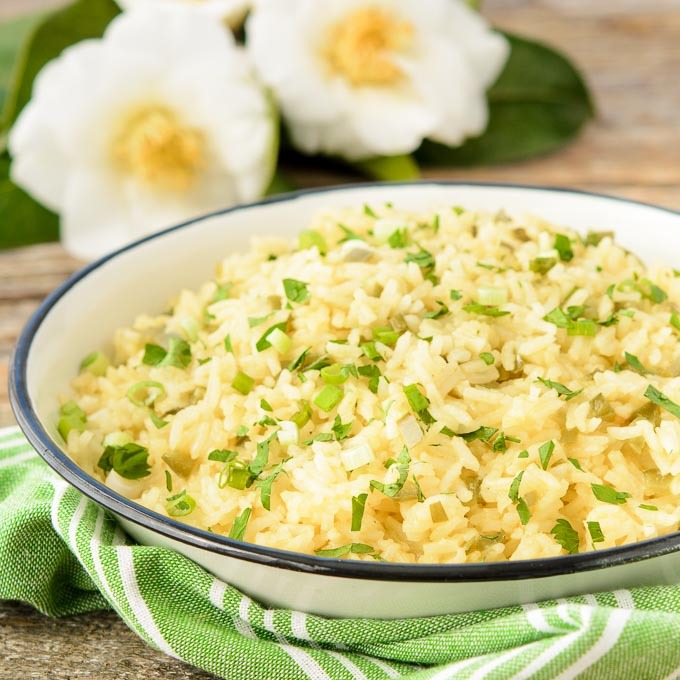 Spring Green Rice is buttery and loaded with green vegetables and herbs; green onion, jalapeño pepper, bell pepper, and parsley. Great side dish for spring. Reserve and set aside 2 tablespoons of sliced spring onion for garnish. Melt butter in a medium saucepan. Add remaining onion, jalapeño pepper, bell pepper and cook over medium heat until softened, about 5 minutes. Add rice and stir to coat well with butter. Cook for 4 minutes, stirring occasionally. Add vegetable broth and bring to a boil. Reduce heat to low, cover, and cook until rice is tender, about 20 minutes. 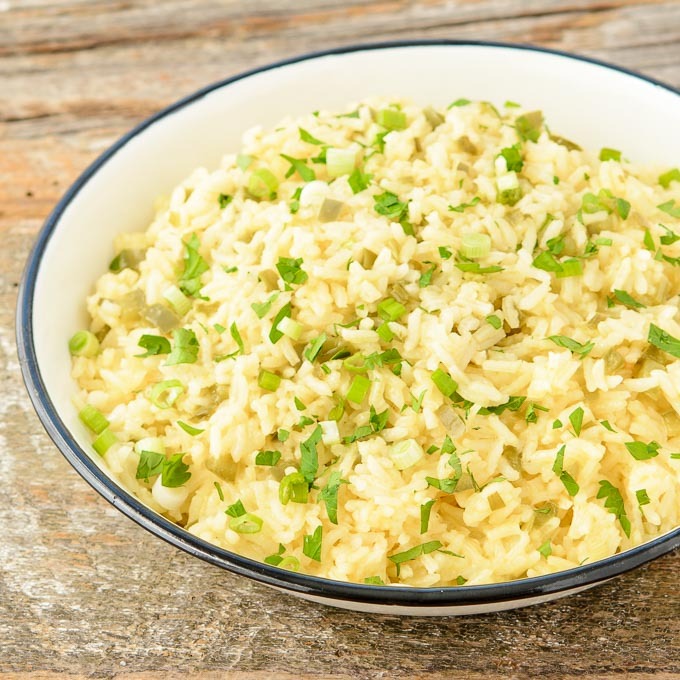 Transfer rice to a serving bowl and garnish with sliced onion and chopped parsley. what a great spring side! I like the different ways you bring in green to enhance the flavor. You know I’m going to love this when you start adding jalapeños! Great side dish, Renee, and so bright and fresh looking too. Ohhhhhh I must try this. I love anything green but I love that it has a kick too! What a lovely recipe! Such beautiful colors and flavors, and I love that you used vegetable stock to add even more to it! Green is certainly calming and soothing. And a terrific color for rice! What a delicious side for most any meal! So ssimple but pretty. I can’t wait for fresh vegetables in our CSA this year…just 6 more weeks! Green is my favorite too! Love how simple this recipe is an can be adapted in so many ways! Perfect!! Dave would love this dish! He really loves rice 🙂 Love a good spring dish! I keep wanting to make a dish with rice to broaden my dinner horizons. This is the perfect way to do so. Looks delicious and fresh for Spring! Absolutely gorgeous rice dish. It would look absolutely lovely on an Easter buffet table. What a simple, pretty. classic dish to serve for spring. You just know those flavors are going to accent whatever dish it is served with. I am thinking some BBQ ribs would be very happy to share the plate with this dish! Such a simple way to refresh a basic rice dish, love it. I love this recipe with a pop of green and a bit of spice from the jalapeno. What a way to add some color and extra flavor to a rice side. 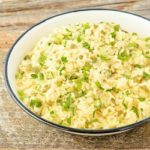 I love the idea of adding green onions! What a lovely side rice dish!! I LOVE it’s freshness and comfort at the same time! Your pic is over the top beautiful! What a beautiful dish so full of fresh flavors!! 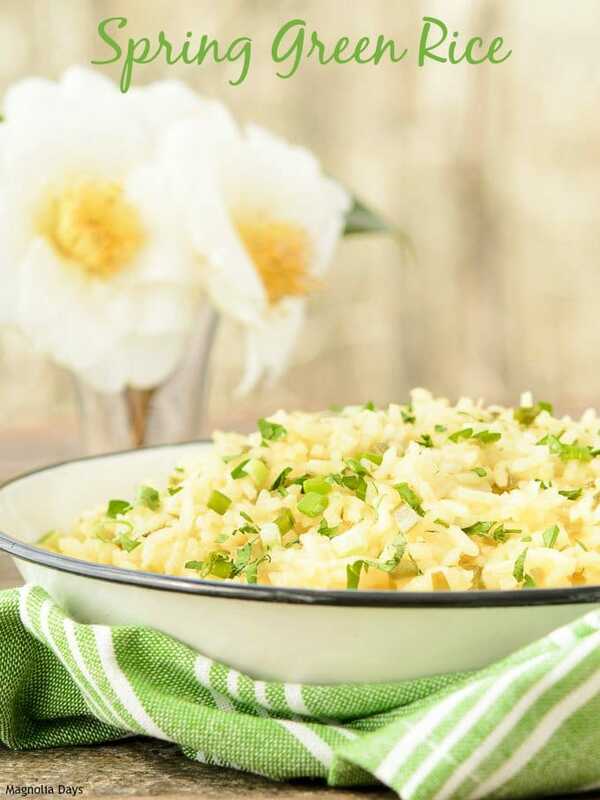 It is perfect for Spring, and I definitely have to make this for my rice loving husband! Thanks for sharing! I’m always looking for new rice recipes to add to my repertoire. This one looks delicious! I am always up for a good rice recipe! This looks so tasty! What a gorgeous side dish! Green certainly reminds me of Spring and new beginnings. Green is one of my favorite colors too 🙂 I love all the greens you used in this dish, it just screams spring! Oh Renee, what an incredibly lovely dish! It’s just gorgeous and looks delicious! This looks delicious! I love the science behind colors and emotions too, so fascinating! I painted one wall in my office (the one I face when sitting at my desk) bright orange because that is said to evoke feelings of creativity and productivity. Our bedroom walls are an olive green, specifically because it promotes calm and rest. This sounds like the perfect side dish to me! I;m a huge rice fan and these greens only make it better! Love the flavor combinations you have going on here. This rice would make for a wonderful side any time of year!